View the International Space Station and other orbiting satellites! We offer both a free and basic web-based satellite tracking application and with a more sophisticated graphical and integrated full-featured experience a Windows UWP application. With the web-based tracking application any web-browser running on an Android, Linux, or iPhone should work. The UWP application runs on Windows 10+ desktops and devices. Give it a try, it is free - just follow the above links! 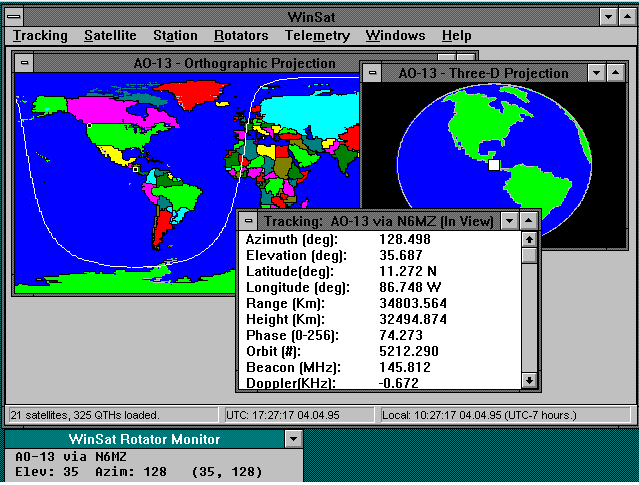 FOX-1D (AO-92) is easy to track from either our website or application. In the search menu, just type in AO-92 and you will find it for tracking. A low Earth orbit (LEO) is an orbit around Earth with an altitude between 160 km (99 mi) and 2,000 km (1,200 mi). LEO demonstrate an orbital period of between about 84 and 127 minutes. Orbital decay is experienced when objects are below approximately 160 km (99 mi) primarily due to atmospheric drag. A medium Earth orbit (MEO) is an orbit around Earth with an altitude between 2,000 km (1,200 mi) and 35,786 km (22,236 mi). Medium Earth orbit's demonstrate an orbital period between about 2 and 24 hours. MEO's are sometimes called intermediate circular orbit (ICO). A high Earth orbit (HEO) is an orbit around Earth with an altitude above geosynchronous orbits at 35,786 km (22,236 mi). High Earth orbit's demonstrate an orbital period greater than 24 hours. High Earth orbit’s exhibit an apparent retrograde motion. The Earth’s rotation speed is faster than the objects making the objects ground track to appear to be moving westward compared to the Earth. A geostationary orbit, geostationary Earth orbit, or geosynchronous equatorial orbit (GEO) is an orbit around earth that is circular at 35,786 km (22,236 mi) above the Earth’s equator. An object in this type of orbit follows the Earth’s rotation. This means the orbit has an orbital period each to the Earth’s rotational period of one sidereal day. The object appears to motionless to an observer on Earth. The objects do make a small figure-8 ground track motion. A highly elliptical orbit (HEO) is an orbit around Earth where the object has a high eccentricity. Objects with this type of orbits have an extremely elongated path around the Earth. These types of orbits have an advantage that allow the object to be over parts of the earth for long periods of time. For this type of orbit, the apogee will be high and the perigee will be low. Other names for HEO orbits have been Molniya and Tundra orbits. This type of orbit depicts the orbit of the Earth's Moon. The Moon orbits the Earth at an altitude between 357,000 to 399,00 km. A graveyard (junk or disposal) orbit is an orbit above geosynchronous orbits, above 35,786 km (22,236 mi). Objects are moved here one their operational life is over to avoid crashing into other objects and generating more space debris. The Chinese Tiangong 1 satellite reentered the earth's atmosphere and burned-up April 2, 2018. In memorance you can still psuedo-track using the last set of NORAD keplerian elements for the satellite. Click here for the simulation. 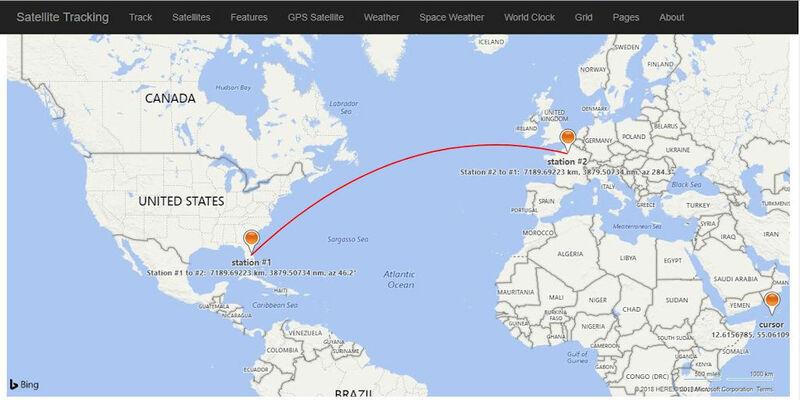 You can track the International Space Station (ISS) from you location using either our web-based or native application. Click here to track. The International Space Station (ISS) orbits the earth with a inclination of 51.6429°. This means that space station will travel up to 51.6429° North and 51.6429° South. It's viewable footprint will of course go further in each direction. To see where it is exactly, click here to track. The International Space Station (ISS) orbits the earth with a period of 92.6 minutes. This means it circles the Earth about every one and half hours. To see where it is exactly, click here to track. You can view the video from the International Space Station (ISS) as it circles the Earth here. The video is also available when you are using our Windows based application Satelltie Tracking. Calculations are based upon the Keplerian Data Elements published by NORAD. The elements sets are accurate enough to be used to calculate and predict where the satellite will be in a live and realtime fashion as long as the orbit doesn't change too much. If the satellite's orbits perturbs enough, a new set of elements needs to be published to be very accurate, but older sets still can provide useful predictions. To see just click the button to download the application from the store. After the application downloads, you'll be tracking in just a few moments. It's easy and fun! Starting with the first Windows based satellite tracking program, WinSat™, the technology is now expanded being the first Universal Windows Program (UWP) satellite tracking application on Windows 10. See the categories and list of satellites to track here. There will be: satellite radio, satellite tv, satellite internet, satellite map satellites, satellite antenna, satellite broadband, satellite communication, satellite dish, satellite earth, satellite finder, satellite frequency, satellite for rv, satellite finder meter, satellite glass, satellite gps, satellite images, satellite imagery, satellite jobs, satellite kit, satellite launch, satellite map, satellite maps free, satellite meter, satellite navigation, satellite orbits, satellite phone, satellite receiver, satellite radar, satellite tracking, satellite televsion, satellite uplink, satellite downlink, satellite view, satellite view of my house, satellite weather, satellite watch, satelltie zones, satellite zoom, silverlight satellite tracking, and satellite zoom into earth. ISS sightings over your city and spot the station. This page provides some information about the station. Calibri (proportional font): My son says one space after a period looks good at the end of a sentence (1 space next). I say two spaces after the period is better. My son says one space after a period looks good at the end of a sentence (2 spaces next). I say two spaces after the period is better. Courier (mono-space font): My son says one space after a period looks good at the end of a sentence (1 space next). I say two spaces after the period is better. My son says one space after a period looks good at the end of a sentence (2 spaces next). I say two spaces after the period is better.